Book Review: 'South Pole Station' By Ashley Shelby Ashley Shelby's debut novel — set among an appealing mix of nerds and oddballs at Antarctica's Amundsen-Scott research station — is a refreshing diversion from summer's heat. Feeling hot? Ashley Shelby's debut novel, set among an appealing assortment of nerds and oddballs at the Amundsen-Scott South Pole Station in Antarctica — where 50 below zero is considered downright balmy — is a refreshing diversion from a heat wave. 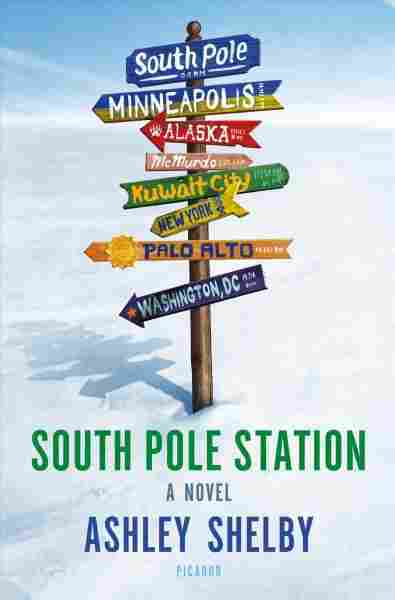 If you like literature that transports you to exotic locales beyond the reach of commercial airlines and enables you to view hot topics from cool new angles, South Pole Station is just the ticket. It's a novel about esoteric research that clearly required a ton of research to write, yet doesn't smell of it. Scratch that: It's a novel about the brilliant misfits who are attracted to esoteric research, the kind that requires spending months on the bottom of the earth, in a horizonless "landscape of snow without end." Shelby's writing is pithy and funny, and her band of eccentrics are scrappy loners who are best suited to the company of other loners. In fact, from the cosmologists and astrophysicists (dubbed "Beakers") to the construction workers ("Nailheads") to the kitchen, medical, communications and sanitation support staff, they've been screened for that very ability to weather not just extreme cold but extreme isolation. At the heart of Shelby's novel is Cooper Gosling, a talented but blocked 30-year-old artist, who, in the wake of her twin brother's suicide, has decided that the NSF's Antarctic Artists & Writers Program is just what she needs to restart her life, "the nuclear option, the force-quit." We meet Cooper during her vetting process, in which she's flabbergasted by hundreds of questions like "True or false: Sometimes I just feel like killing myself" and "I prefer flowers to trucks." Cooper hasn't picked Antarctica out of thin air: From early childhood, she and her brother were enthralled by Apsley Cherry-Garrard's account of Robert Scott's ill-fated polar expedition, The Worst Journey in the World — which was their father's idea of suitable bedtime reading for tots. Cherry-Garrard, the very definition of a survivor, is her inspiration, and this quote — which, I have to say, wouldn't send me to Ice World — is her touchstone: "If you are a brave man, you will do nothing; if you are fearful you may do much, for none but cowards have need to prove their bravery." It can be challenging to keep Shelby's motley misfits straight, but it's fun watching them bicker, pair off, and finally band together under duress. All of them, like Cooper, come weighted with emotional baggage, which Shelby gradually unpacks by switching between points of view. Frequent backtracking leads to some repetition, and she holds off a few revelations for too long. Amidst the booze, high drama and heated discussions about the differences between knowledge and belief, a welcome though not unexpected love story unfolds. There are fascinating insider details, like the scoop on waste management and the logistics of meal planning (Shelby's sister is one of few women to have wintered-over at the Pole). But despite many vivid descriptions, including the interior of an equipment-strewn plane that "looked like the digestive tract of a cyborg," the novel oddly fails to fully convey the brutal cold. More questionable is Cooper's unbelievably sanguine reaction to a potentially career-ending accident out on the West Antarctic Ice Sheet — a misadventure with far-reaching repercussions which I'll leave for readers to discover. That said, Cooper's strength as a heroine is her extraordinary openness, even to people who hold opposing ideas. And in a book stuffed with clashing viewpoints and characters who frequently initiate conversations with the words, "I have something to show you" — be it an unidentified frozen corpse or the "Let's Roll" lapel pin that makes a congressman who had nothing to do with the heroism on United Flight 93 feel like a fraud — such receptivity is a heartwarming beacon of hope. In this unusual, entertaining first novel, Ashley Shelby combines science with literature to make a clever case for scientists' and artists' shared conviction that "the world could become known if only you looked hard enough."